In April 2001, Tesco announced their ?1 billion profits breakthrough. Analysts said their success was due to investment in IT in stock controls. For this barcodes are crucial, they link IT and physical distribution. Stocks are essential to every business. Stocks carry an opportunity cost, which include warehouse space, handling, deterioration, insurance and administration, as well as the cost of finance to pay for all of these. The value of having stocks of inputs must be set against the cost. Stocks ensure that the customer has a visible choice and immediate delivery. Tesco must strike a balance between the achievement of customer satisfaction and the cost of holding stocks. Tesco works in an oligopoly and so competition is always high. They must always think of new and improved ideas to give themselves the competitive advantage, which is impossible, if they do not have a firm stock control system that works effectively. 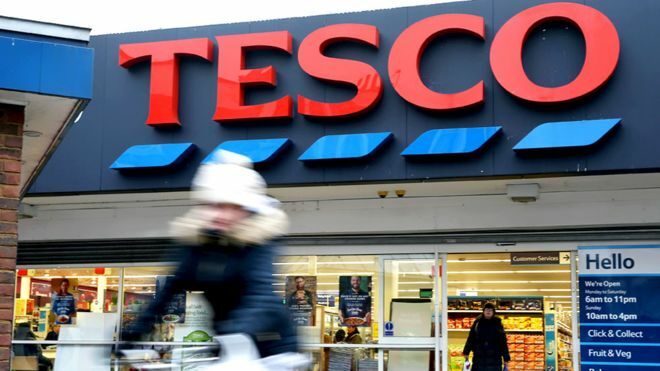 Tesco takes into consideration the ideas that many other firms use, which involves the setting of three levels, a maximum, re-orders and buffer. In setting a maximum stock level the firm is able to compare the discounts of buying in larger quantities against the opportunity cost of holding the stock. The buffer stock level is a minimum reserve level, which depends on flexibility and reliability of suppliers. This simple idea is good for firms such as Tesco to find their optimum policy; though Tesco does not use this method exactly much of its stock control is based around the same idea. As Tesco is a supermarket it means that it has a large amount of stock all coming from different suppliers from different warehouses, towns and even countries. This means that the stock control method that Tesco employs is a lot more complicated than the simple graph of three different levels. Tesco has its own department in every store with at least ten employees working at any time day and night to ensure that their stock is adequately managed, (apx 1). This obviously proves that Tesco takes this idea very seriously. After being named the biggest and best food retailer in central Europe they are keen to uphold their reputation and bring and even bigger and wider range to offer their customers, (apx 1). Every time there is a delay between the delivery of stocks and their usage, resources are lying idle and there is a real cost. It follows that efficiency could be improved by reducing these вЂgapsвЂ™ to a minimum. The method of вЂjust in timeвЂ™ or вЂJITвЂ™ is a strong part of the management of stock at Tesco (apx 1). This method is particularly effective due to the nature of TescoвЂ™s retailing and turnover of stock. Tesco sells over 10,000 different items even in its smaller stores and so to keep a high back up stock of any of these would mean a substantial amount of warehouse space would be needed. Therefore the just in time method is perfect for Tesco and its line of management and sales. In this the buffer stock is virtually eliminated, the re-order quantity is small and the procurement time is short. The effect is to reduce around 50% of the stock wit a corresponding release of resources, so improving efficiency, (apx 1). In what ways does Tesco implement these stock control methods? Stock control is especially important for supermarkets. They carry a vast range of merchandise, yet each individual product has a different unit value (and hence opportunity cost) and a different speed of turnover. Tesco was one of the first chains to adopt laser scanning and computerized stock control, (apx 1). This meant that stock levels could be monitored with every sale. Automatic re-order levels could be set to rigger fresh supplies, thus immediately reflecting any shift in consumer preferences. These orders directly affect the pattern of output at TescoвЂ™s suppliers and so their orders for materials and so back down the chain. Each store has a team of around ten people; they each have handheld computers that they use to scan items and record the stock levels on shelves. This enables Tesco to not only monitor their levels of stock on the tills but also on the shelves and even in the warehouses. As each delivery is made it is broken down into different departments that then deal with it individually. This means that the workers are specialized to that department and know what needs storing and what needs replenishing, (apx 1). There is a constant work force of around 40 people that work throughout the day merely stacking shelves and replacing stock. Their task is simple but vital; if any of them were to not work efficiently then the warehouse would not run to the speed and efficiency needed for them to turnover all the many thousands of items each day. Tesco uses IT as a vital part of their ordering and restocking, (apx 1). As items pass through the checkout they not only register with the database so that customers can be charged but they also update the system that the stock has been sold. Tesco has re-order quantities set for each items as many of them vary in turnover and speed of delivery. For example the stock of specialist herbal tea bags is set low, as the turnover for this is a lot slower than something like milk or baked beans, which need constant replenishment. The average turnover for fresh food is shorter than that for an item such as pet food. Therefore the stock levels for each are adapted not just to the speed in which they are sold but also their expirery lengths. Tesco sets the reorder levels for fresh stock much lower so that they can reduce wastage. However this can mean that risk of вЂstock outвЂ™ is higher. The reorder level for yogurts is 11% whereas for an item such as pedigree chum its 24%. Fresh produce is also delivered right before the store opens while dry goods are delivered at less busy times during the course of the day, (apx 1). In doing this Tesco is taking a risk though it is one that pays off more often than not, and they are able to create better efficiency. Tesco does not only use IT at the tills, each store has around 20 PDCUs, or mini computers, . These are handheld and are used for the transfer of stock, for example from shop floor to caf?, for damages, wastage and shrink, (apx 1). Often Tesco finds it hard to keep track of where all its stock is and these PDCUs newly introduced a year ago help them to keep a grip on stock management. Not only is it useful for finding out which stock as been moved to different department but is also used in measuring shrink totals. Shrink is the word used for the amount of stock that has вЂdisappearedвЂ™. This can be due to many reasons, either from theft, department sales or unrecorded wastage, (apx 1). One of the flaws in the Tesco replenishment system is that when items go through the till and the till canвЂ™t register the price then checkout operators merely put the price through under its department. This means that stock can be sold but the restocking system is never updated. If a very popular item for example value bread is not on file then this causes immense problems not just at checkouts but at stock control too. Having fast and efficient checkouts is a very important part of not only customer service but also stock control. Ultimately good stock control is needed to provide a service to customers that beats all other competitors. Many customers regard stock as one of the most important aspects of a supermarket, a fair reasoning because what is a supermarket without any food, (apx 1). Tesco has said that they aim to deliver not only unbeatable prices but also unbeatable service and most importantly availability, (apx 1). Customers are quick to complain if what they want is not on the shelves. Tesco is so confident with its stock management efficiency that it offers its customers the item free next time if they do not have it in stock; this idea was soon followed up by companies such as Blockbuster. Tesco has around 15 central warehouses which are strategically placed around the country, (apx 1), each of around 300,000 square feet. These aid them to get quicker and more efficient supply chains. When stocks are brought into the country they are instantly sent to one of the central warehouses. It is from these that the stock for each individual store sends their stocking orders. The orders are sent from the main computer in every store which is continuously updated by the tills. This computer is programmed wit the restocking levels for each individual product and it has an automated ordering system. When a certain item runs below the replenishment stock level then the computer sends the details of the product to the mainframe computer situated in the warehouse that is nearest to them. The warehouse will then instantly send out the order and it will arrive within 24 hours. Having this system enables the period of waiting to be minimized, resulting in the buffer zone being almost eliminated. It also means that in the event of вЂstock outвЂ™, stocks can be quickly ordered and delivered, meaning the period of loss is lessened. Advantages to Tesco In achieving efficient stock control methods Tesco is able to cut down its opportunity costs, cutting costs overall and therefore making a higher profit, ultimately the main aim for any business. The implementation of any efficient stock controlling system is going to be substantial, and Tesco must weigh out the costs wit the benefits that it will provide. Tesco is continuously updating their stock control methods and thinking of new ways to improve efficiency. However most schemes can only be carried out with sufficient capital and investment, (apx 1). As Tesco is a large firm then it is able to do things that many other firms wouldnвЂ™t in the constant battle to be more efficient. The use of technology is vital to TescoвЂ™s development and improvement. As IT is constantly becoming more advanced then Tesco is able to take advantage of this. Their computerized ordering system is vital to ensure that they have a constant supply of all goods coming in. It also means that Tesco are able to cut down on warehouse space, time and even employees, (apx 1). Whereas before all of Tesco stock control was done by hand by a team of around 25 in each store, now Tesco is able to employ less people and get the work done in half the time. Ordering is instant and human error is cut out entirely. Before the electronic system was introduced many time orders would be placed wrongly and the stores would be overstocked, therefore resulting in Tesco having to use up valuable warehouse space and loosing money when they had to reduce the stock in order to sell it quick enough. Some ordering is still done by hand in Tesco, for example promotional ordering. When Tesco joins with a firm or supplier in order to put out a promotion such as buy one get one free (BOGOF), they order the stock by hand, (apx 1). As this means that the computer does not need to be constantly updated and changed as something goes on and off of promotion. They often raise the re-order level, as it is very costly to run out of stock when something is on promotion. Tesco promises customers that they can receive a вЂrain check voucherвЂ™ which enable them to get the item at any time at the price promised if they do not have it in stock, (apx 1). Though this makes customers feel more secure in their shopping and gives Tesco the competitive advantage, it takes an extreme amount of organization and control to make sure that nothing can go wrong. Tesco aims to please its customers, as if they feel they have shopped well then they will do so again. Therefore it is vital that Tesco is efficient and that they are able to do everything that they promise. Tesco are able to monitor which items are the most popular by new innovations such as clubcard, (apx 1). These are able to monitor which items are more popular and with which sectors of the market. Tesco is then able to put promotion on items which they know customers demand. As customers are shown to respond positively to promotional sales and Tesco has a greater turnover. This is especially important over the Christmas period when Tesco is under a vast amount of pressure, from customers and suppliers. Due to the fact that many suppliers do not operate over the Christmas period Tesco must estimate their sales and predict the stock that they will need. Before the computerized systems were introduced this process was done by hand and it was evidently luck whether they got it right. Now the tills are able to predict the levels of stock needed through monitoring previous sales. Not only this but the tills are able to give Tesco a sound idea of what items are their best sellers and what they to place on offer in order to offload the excess stock. The efficient methods that Tesco employs have many advantages, the first and most obvious is that they are able to make a greater profit otherwise it would be a useless investment. They also gain a higher customer satisfaction and therefore greater customer loyalty. They are able to employ less people with the investment of IT and their systems are a lot simpler to change and operate. They are able to cut back on errors and loss from over ordering and вЂstock outвЂ™. They can build stronger and more reliable links with their suppliers and therefore they can be a lot more flexible to adapt around customer demand, (apx 1). In a very competitive market, Tesco needs to do everything in its capacity to gain a competitive advantage. The efficient method of stock control that they hold is one of the key elements that keep them ahead of the competition. Does Tesco have efficient stock control methods? Effectively Tesco does employ a very proficient method of stock control, they are continuously updating and looking to improve their systems and this is one of the reasons that they have now become so efficient. Being such a large company it enables them to take advantage of many things that other competitors canвЂ™t. They are able to take advantage of economies of scale for example. This involves technical economies, as Tesco is bigger they are able to employ bigger and better machines. Larger machines are able to work more cheaply, and also produce much more. They are a lot more efficient, leading to a fall in costs and prices, thus creating a mass market and greater competitive advantage. Tesco also employs managerial economies, as they are able to hire specialists who are highly skilled at what they do. Using their skills the purpose of these specialists is to reduce costs by organizing stock control more efficiently. As Tesco reaps these economies of scale they are able to make average cost fall as output rises. Tesco is effective at using all these advantages and lowering average total cost. The ultimate aim of efficiency is to lower opportunity cost and therefore to make a higher profit. Tesco does this extremely effectively and they employ all systems that are open to them creating one of the most efficient stock control systems of any supermarket, (apx 1). There is only a very small area that Tesco can improve in, and this is extremely difficult to tackle. Often Tesco finds that its stores are in fact over selling, and their turnover is beyond their capacity, (apx 1). This results in the fact that the store is in fact too small to deal with the constant demand being put on it by its customers. This can result in many things, such as not enough staff, not enough tills to cope with the amount of customers and also not enough warehouse space to cope with the amount of deliveries and turnover of stock. There is very little that Tesco can do to tackle the problem of over selling and lack of warehouse space. However they do recognize the problem and them building several new central warehouses and extending the warehouses in some stores that are finding it hard to cope with the constant demand. Proving that, though Tesco are not perfect in their management of stock, they do everything in their power to be so and to uphold their competitive advantage.